三浦直行 2004a (Review). 発生・代謝遺伝子として注目を浴びるフォークヘッド遺伝子. 蛋白質核酸酵素 49, 2558-2570. Biggs et al. 1999a. Proc Natl Acad Sci USA 96, 7421-7426. Wang et al. 2009a. BMC Evol Biol 9, 222. Nakae et al. 1999a. J Biol Chem 274, 15982-15985. Nakae et al. 2000a. Differential regulation of gene expression by insulin and IGF-I receptors correlates with phosphorylation of a single amino acid residue in the forkhead transcription factor FKHR. EMBO J 19, 989-996. Giannakou 2004a. Long-lived Drosophila with over-expressed dFOXO in adult fat body. Science 305, 361. Hwangbo 2004a. Drosophila dFOXO controls lifespan and regulated insulin signaling in brain and fat body. Nature 429, 562-567. Matsuzaki et al. 2005a. Acetylation of Foxo1 alters its DNA-binding ability and sensitivity to phosphorylation. Proc Natl Acad Sci USA 102, 11278-11283. Lam et al. 2013a (Review). Forkhead box proteins: tuning forks for transcriptional harmony. Nat Rev Cancer 13, 482-495. Medema et al. 2000a. AFX-like transcription factors mediate cell-cycle regulation by Ras and PKB through p27kip1. Nature 404, 782-787. Accili and Arden 2004a (Review). 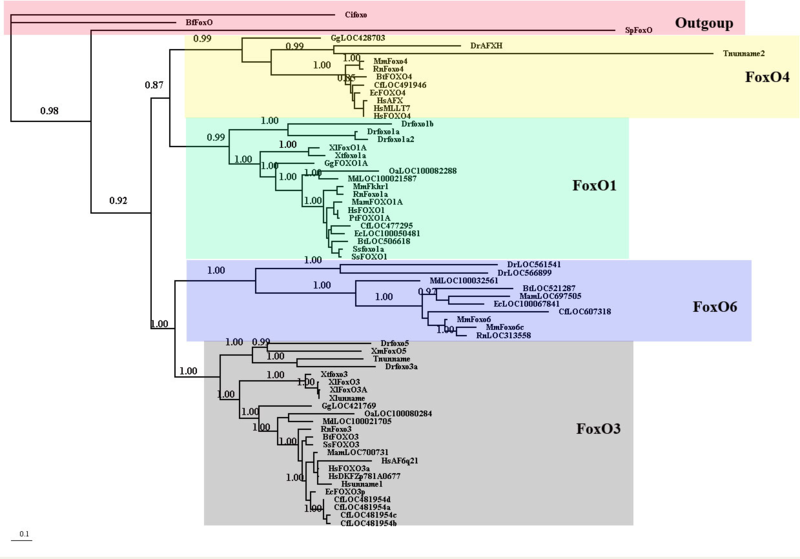 FoxO as the crossroads of cellular metabolism, differentiation, and transformation. Cell 117, 421-426. Brunet et al. 2004a. Stress-dependent regulation of FOXO transcription factor by the SIRT1 deacetylase. Science 303, 2011-2015. Furuyama et al. 2000a. Identification of the different distribution of mRNAs and consensus binding sequences for mouse DAF-16 homologues. Biochem J 349, 629-634. Broughton and Partridge 2009a (Review). Insulin/IGF-like signaling, the central nervous system and aging. Biochem J 418, 1-12. McCormick et al. 2012a.New genes that extend Caenorhabditis elegans' lifespan in response to reproductive signals. Aging Cell, 11, 192-202. Sun et al. 2012a.Nutrient-dependent requirement for SOD1 in lifespan extension by protein restriction in Drosophila melanogaster. Aging Cell 11, 783-793. Chakrabarti et al. 2009a. FoxO1 controls insulin-dependent adipose trigly- ceride lipase (ATGL) expression and lipolysis in adipocytes. J Biol Chem 284, 13296–13300.